For the invites we used a scallop print gift box with a coffee mug inside, along with rolled up paper invites and confetti for a festive touch. 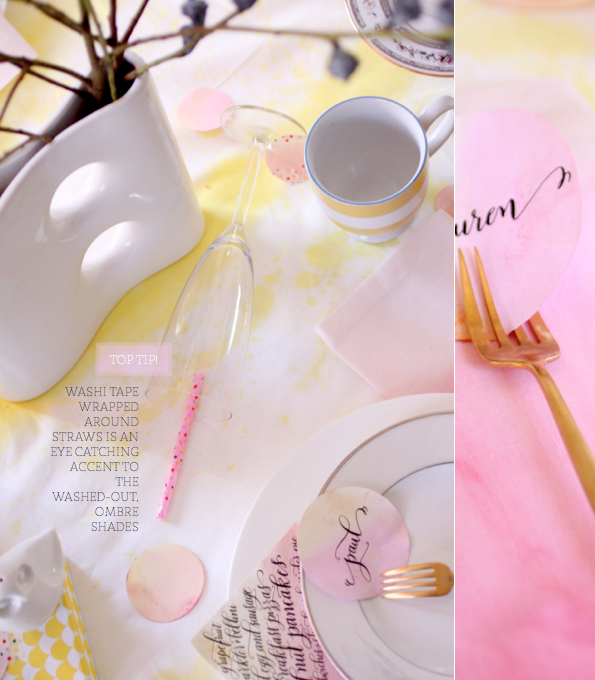 Claudia of Fig2Design dip dyed beautiful and playful invites, menus and place cards in softer pastels shades of the core pink and yellow palette. 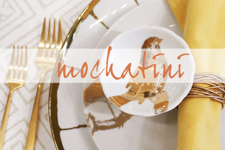 Michelle’s calligraphy added a touch of sophistication to each piece. We also decided to key into the ombre dip dye trend, which proved an enjoyable and inexpensive DIY approach to creating unique table linens. Fold a solid white cotton bed sheet to align the edges and dip in liquid dye to create an instant no-sew tablecloth. 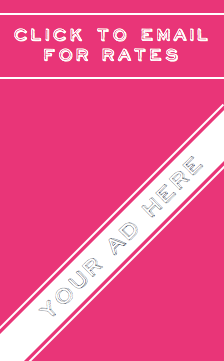 For this scheme we used pink and fuscia dyes (from Rit) to get an ombre effect, with the whole DIY costing less than $10. The flower centrepieces anchored the stationery and linens by tying the scheme together. Three milk bottles filled with vibrant dual-toned roses, white and fuscia ranunculus, and eucalyptus pod branches formed the multiple-piece centerpiece. The eucalyptus branches added height and sculptural interest to the arrangement, drawing the eye upwards to the colorful dip-dyed paper lanterns. Opting for a multiple-piece center arrangement makes it easy to move a couple of the vases during the meal to make space for dishes without compromising on the look. Colourful, stylish and practical - just the way Mr. Bazaar likes it! Love it all...great job Will, Claudia + Michele! 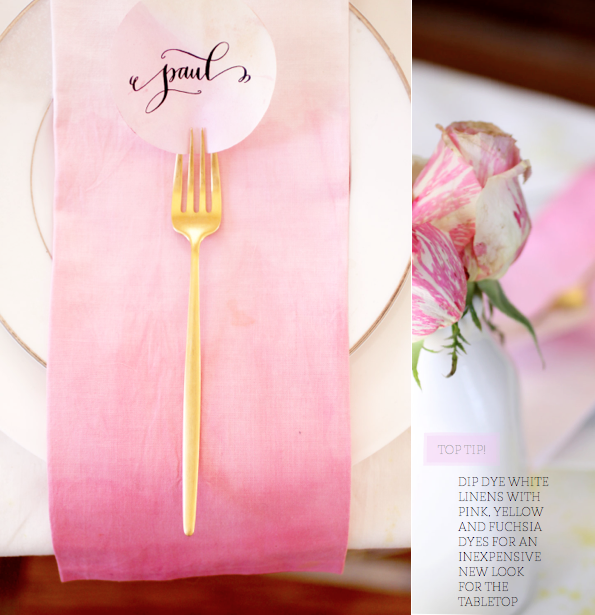 those ombre napkins are sweet! Right? And so easy to DIY as well! 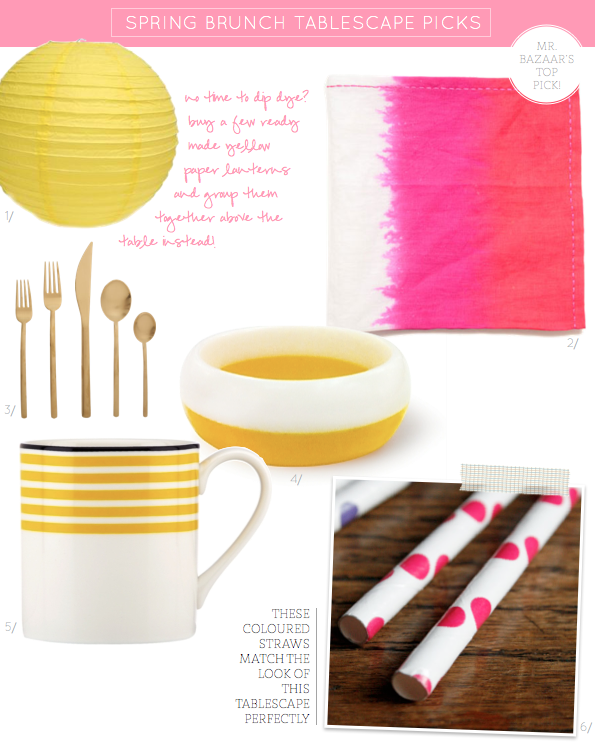 Favorite yellow striped mug! I enjoy mine every day. It's been on my To Buy list for way too long. Think it's time to indulge! 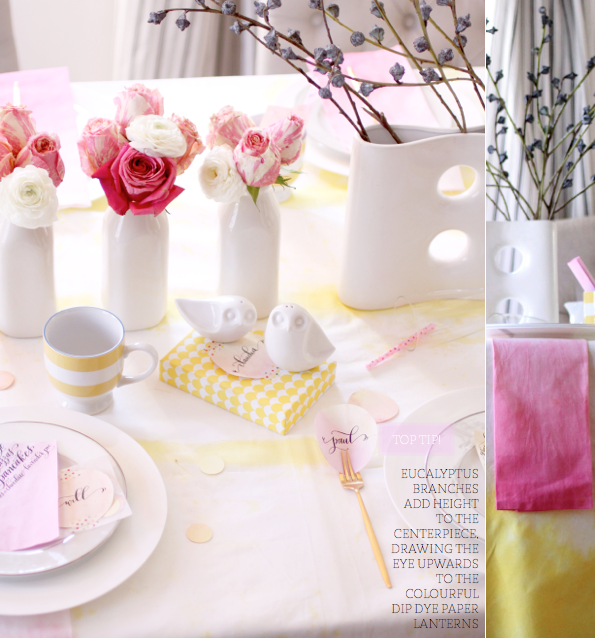 love the cheerful palette ... perfect for spring. My absolute favs are those gold flatware .. stunning pieces! omg im going crazy over the golden flatware and those wonderful s&p shakers. Lovely as always! Hello. This is my first time posting here. Just had to say how beautiful this is. Really perfect for spring. Where did you get the salt and pepper shakers? They're adorable! I should have known! Thanks, Will! What an incredibly happy & friendly table. You will find no moody guests here. The tall vase is so pretty. And the Lava flows... Meow! WOW!! That is so nice that I got tears in my eyes. You are so good! Oh I love love love this Will! The roses, the gold flatware, the colours - all perfect! oh my goodness, how pretty is that?! I don't have a word for the two of you ... thank you! I have no words......It´s SO beautiful! 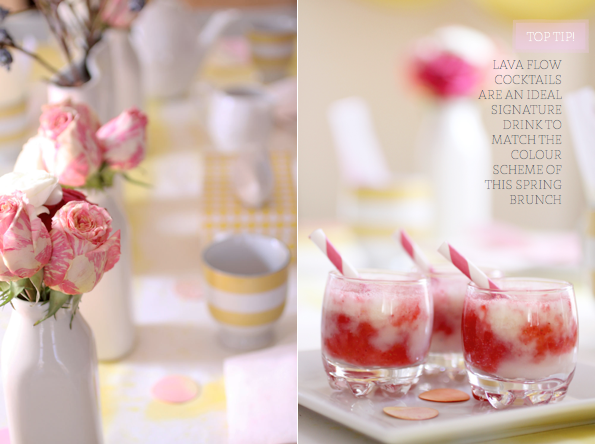 I love the colors, the styling, all the details and the photography - such a feast for my eyes. What stunning work! Bravo to both of you. Those Kate Spade mugs have just skyrocketed to the top of my wishlist... and I don't even make coffee at home! ;) Gorgeous. so pretty! you are quite good at what you do! :) i'm so happy you shared the link to the s&p shakers i need them!! 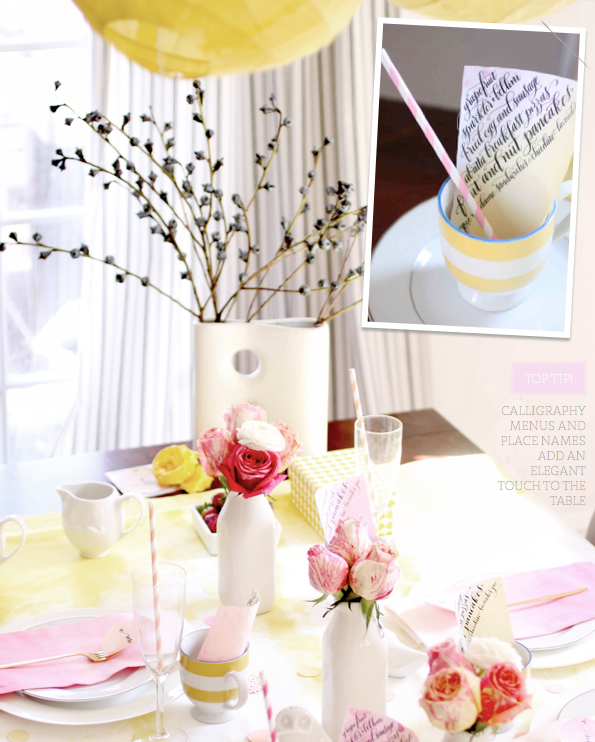 So pretty tablescape, fresh and clean; beautiful white & yellow combo! 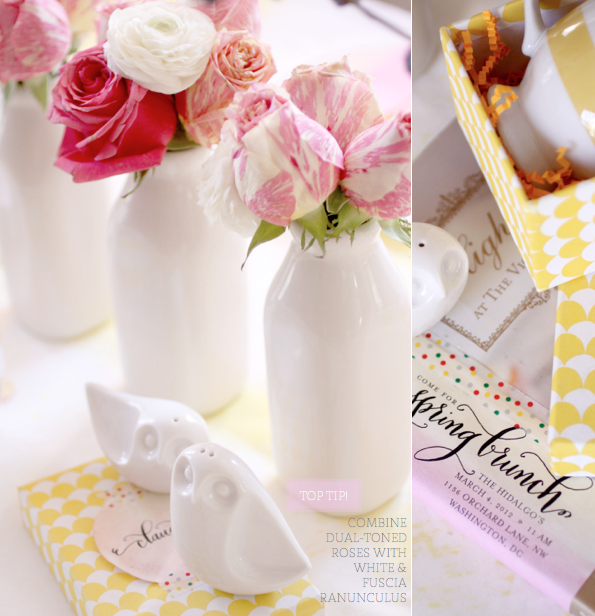 Love these paper lanterns and milk bottles! Oh Spring..... I know you are right around the corner! I love that you have reminded us that bright days are on the horizon. Thank you again for having us, Will! It's such fun to work on these tables capes for you with Manvi. She has a spectacular vision and I'm thrilled to be part of the team. Oh my, love it all. Perfect for spring. Yellow stripes are my thannnng. I need those coffee mugs ASAP! I love this! So fresh! 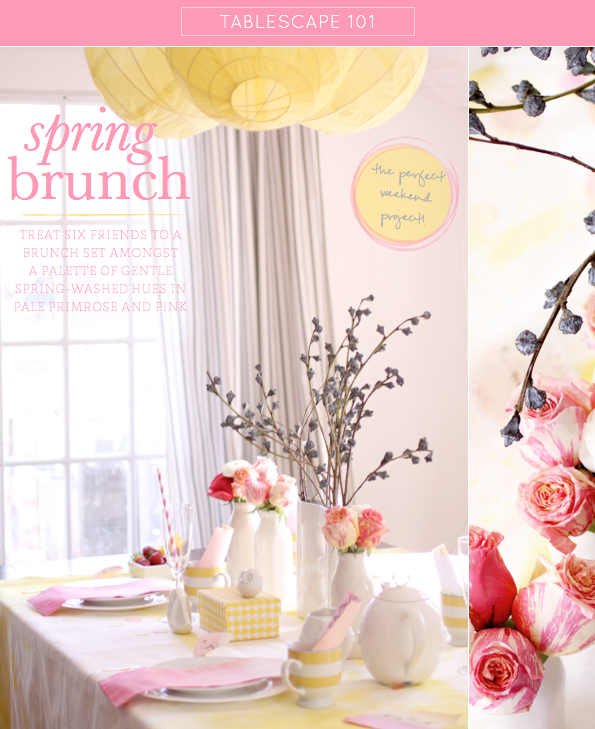 Everything looks so beautiful for a Spring Brunch!! Well this is just perfect. I love the gold accents too! I LOVE THIS! Next month I'm throwing my sister in law a baby shower and she's having a girl -- this color scheme would be perfect for the shower. I really need to learn calligraphy. Love those pretty and super simple name "cards". You did a great job, and I love the details with the confetti colored tape! Very inspirational!!! Oh wow, this is gorgeous, the two of you make such a good team! so warm colour! Your inspiration room for your new place is one of my favourites, too. I love the mix of materials and styles. I just love the colors and objects. really!! !